Becoming a great customer service manager requires a mastery of skills beyond those needed by frontline employees. 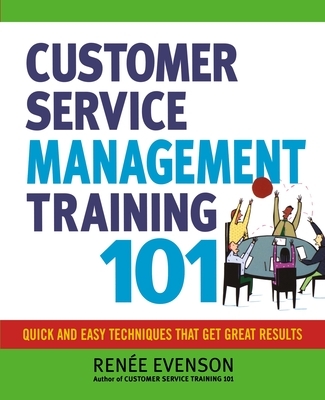 Filled with the same accessible, step-by-step guidance as Customer Service Training 101, this user-friendly book shows readers how to develop the skills they need to communicate, lead, train, motivate, and manage those employees responsible for customer satisfaction. Designed for new managers and veterans alike, Customer Service Management Training 101 covers essential topics, including: Planning and goal setting - Time management - Team development - Conflict resolution - Providing feedback - Monitoring performance - Conducting meetings - Managing challenges - Listening - Verbal, nonverbal, and written communication. Readers will learn to identify their personal management style, develop core leadership qualities, and efficiently focus on their own development as managers. Packed with checklists, "real world" practice lessons, and examples of the right and wrong ways to do things, this is the one book every customer service manager needs to thrive. RENEE EVENSON has worked in the customer service management field for over 30 years, including 15 as a customer service manager and trainer at BellSouth Telecommunications. She has a degree in organizational psychology and is the author of "Customer Service Training 101" and "Award-Winning Customer Service."